Eco-Ethonomics’ New Social Impact Report Card | Eco-Ethonomics Inc.
Eco-Ethonomics prides itself on leveraging cross-sector expertise to provide strategic advice, foster collaboration and facilitate cultural change in order to create social, environmental, and economic impact. We have had the pleasure of serving a diversity of populations and supporting non-profit organizations, various levels of government, and private sector companies across the country. An infographic is a great way to clearly and quickly share important information, key data, and valuable knowledge with others. Infographics can also be used to track the work you are doing and the impact it’s having. 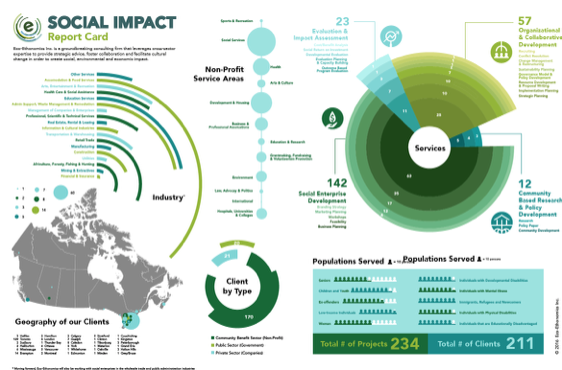 We’ve designed a Social Impact Report Card for our company and want to share it with you. Please don’t hesitate to share what you’re up to with us, or reach out if you’d like to discuss how we may help to maximize your impact.